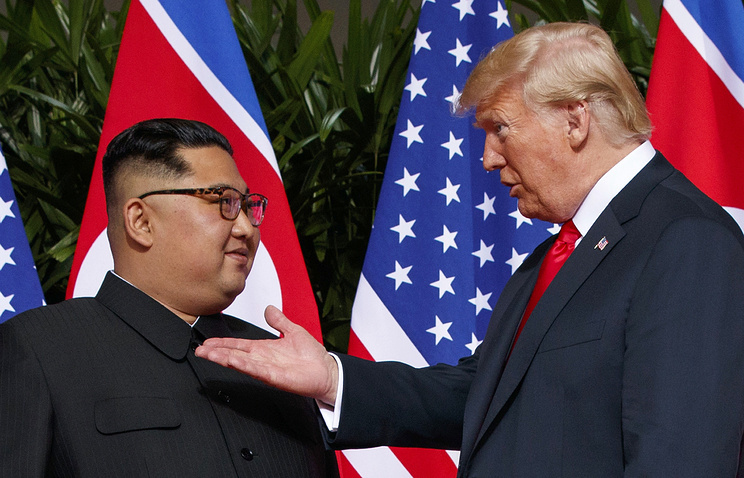 The historic meeting between the leaders of the United States and North Korea in Singapore has split those who viewed it as the first step towards normalization on the Korean Peninsula and those who called the document signed by Donald Trump and Kim Jong-un "weak" and "without substance," Kommersant writes. The North Korean leader gave no guarantees of immediate disarmament, while the US president avoided direct security guarantees but promised not to carry out annual US-South Korea drills. Experts agree that Kim Jong-un emerged as the key victor since he succeeded in pulling the rogue state out of isolation and achieving the recognition of equality from the US, neither his father nor his grandfather had managed to accomplish this, the paper writes. The preparations for the first-ever meeting between the US and North Korean leaders was reminiscent of a tremendous reality show and the historic handshake was an informal outcome of the Singapore summit aimed at giving a clear signal to the world: peace and security on the Korean Peninsula is in good hands for the first time over the past dozens of years. A diplomatic "Singapore wonder" occurred: the Little Rocket Man turned into an equal interlocutor and a potential partner of the US leader, Kommersant writes. Kim Jong-un achieved the most important outcome: the signing of an agreement with Washington diverts the threat of a war on the Korean Peninsula, which was quite real this winter, Head of the Asia-Pacific Program at the Carnegie Moscow Center Alexander Gabuyev told the newspaper. Over the past six months, Kim Jong-un managed to end diplomatic isolation, restore tarnished relations with China, hold two meetings with South Korean President Moon Jae-in, host a meeting with Russian Foreign Minister Sergey Lavrov and gain recognition by the US president as "a very talented man" who "deeply loves his country," according to the expert. Go Myong-Hyun, an expert from South Korea’s ASAN Institute for Policy Studies, has called the North Korean denuclearization path "a Libyan scenario vice versa." "The US halts drills, pulls North Korea out of isolation, and Pyongyang vowed to ‘work towards denuclearization’ without any particular timeframe and a plan." He also pointed out that Kim Jong-un pledged to move towards a nuclear-free North Korea rather than "a denuclearized Korean Peninsula." 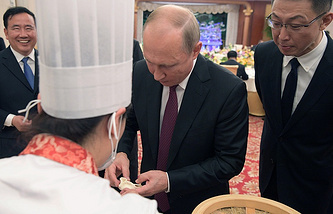 Russian President Vladimir Putin wrapped up his three-day visit to China this weekend during which he held comprehensive bilateral negotiations and took part in the summit of the Shanghai Cooperation Organization. Russia and China signed multibillion-dollar contracts, which included the construction of two additional power units of the Tianwan Nuclear Power Plant and building the new Xudabao Nuclear Power Plant, Izvestia writes. According to experts, the talks set the tone in the relations between Moscow and Beijing for the next few years. The parties confirmed "a very high level" of their relations, Putin said. The Chinese side also positively assessed the outcome of the talks. "The current visit by President Putin is an absolute success," Chinese Foreign Ministry Spokesperson Geng Shuang said. The meeting of the two leaders was held shortly after their election to the new terms, Zhao Huasheng, Director of the Department of Russia and Central Asia at Shanghai Institute for International Studies, told the paper. "For both countries this visit is the new beginning of cooperation for the next five or six years," the expert said. "It once again showed that the sides are ready to continue and enhance cooperation." The SCO summit in Qingdao was held for the first time with the participation of its new members - India and Pakistan, the paper writes. Amid difficult relations between New Delhi and Islamabad, there were fears that Indian-Pakistani bilateral tension would affect the SCO’s activity. However, on the contrary, their membership in this organization made it possible to ease tensions, Yang Cheng, a Sino-Russian relations expert from the Shanghai International Studies University, said. Russia is the West’s major ally in the fight against terrorism, Italian Deputy Prime Minister Matteo Salvini said in an interview with Izvestia. The Lega party leader also emphasized the need to cooperate with Moscow on other global issues. At the G7 summit on June 8-9 in the Canadian city of Quebec, US President Donald Trump called for Russia’s return to the G8. Salvini backed the White House occupant’s call saying that Moscow is a key player on the international arena. "I’m very glad that US President Donald Trump has the same intention regarding Russia as I do. Russia is our fundamental ally against terrorism. We, the Europeans, should work together with Russian President Vladimir Putin to protect our civilization from Islamist extremists," he told the paper. 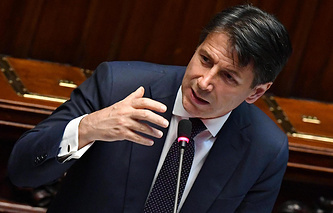 The shift in Italy’s foreign policy occurred after a right-wing coalition won the March 4 parliamentary election and called for normalizing ties with Russia. Compared to the political elites in a number of European countries, where there is no unified stance on relations with Moscow, the majority of parties in Italy call for mending ties with Russia, the paper writes. MP of a regional parliament in Veneto and a member of the Lega party Stefano Valdegamberi told the paper that the latest events on the global arena show that efforts to isolate Russia were a mistake. The new foreign policy line of the Italian government will speed up the restoration of relations between Russia and the West, he stressed. Rosneft’s contract with China’s private conglomerate CEFC on oil supplies to China is not in jeopardy, two sources close to the deal told Vedomosti. CEFC sought to buy a 14.16% stake in the Russian oil giant to the tune of $9.1 bln. The Chinese conglomerate also undertook commitments to buy 10 mln tonnes of oil annually over five years. However, the deal on purchasing the stake was canceled over CEFC’s financial hurdles. Now the company will be restructured and divided into three parts, the sources told the paper. Its trading subsidiary will keep the contract with Rosneft. One of the sources told the paper that the subsidiary’s owner may be state conglomerate CITIC Group, which has bought some CEFC’s assets. 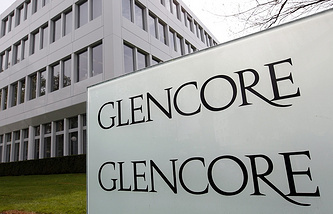 Another source said the company would be transferred for a merger with Chinese private chemical producer Hengli Group in the coming one or two months. Nevertheless, CEFC’s current contracts with Rosneft will be in force and its trading subsidiary will continue working in Russia, the two sources told the paper. Rosneft signed its five-year contract with CEFC for supplying 10 mln tonnes of oil in September 2017. The deal envisages automatic extension for another five years and 50 mln tonnes, the sources close to the signatories said. Rosneft is a major Russian supplier of oil to China, accounting for 76% of Russia’s export to the country. The Chinese market is important for Rosneft, BCS analyst Kirill Tachennikov said. "The growing market with domestic production in stagnation is a good growth area." The risk of losing the contract was zero, Raiffeisenbank analyst Andrei Polyschuk said. The Central Bank of Cyprus has not ordered banks to close accounts of offshore companies, a spokesman for the regulator told Vedomosti, commenting on media reports in early June. Compliance with the Know Your Customer (KYC) principle and other directives from the European Union have always been a condition for opening accounts, he noted. Financial institutions are obligated to check all accounts and ferret out shell companies. Head of Tax Department at UFG Wealth Management Yuri Kulikov confirmed that strict compliance rules have been in effect in Cyprus for years. The checks won’t necessarily end in closing the accounts, Partner at Ronlaw Partners Pavel Romanenko told the paper. Even if a company does not have real business and staff members, but it may present accounts of its parent offshore company, the banks in Cyprus won’t have issues to it, Romanenko said. Cyprus is one of the most popular transit jurisdictions via which Russian businesses channel funds to offshores. Some 90% of funds on the island come from Russia, a partner of a large consulting company said.